Located in the village of Grand Desert, an Acadian community, that has lived off what the land and sea has provided for hundreds of years. A beautiful house and a breathtaking view of the ocean, wetlands and islands await you. A quiet beach is just a walk away. We have clean comfortable beds, spacious rooms with en suites, ocean breezes and delicious breakfasts. The web server used by Changingtides.ca is located near the city of Redmond, USA and is run by Microsoft Hosting. 71 other websites are located on this web server. Most of them are provided in the english language. 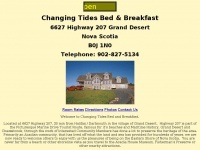 The websites of Changingtides.ca are hosted by a Apache server and were developed in the programming language PHP. The markup language of the website is XHTML 1.0 Transitional. The website does not specify details about the inclusion of its content in search engines. For this reason the content will be included by search engines.